The term bestiarii does actually have some ambiguity in Roman terms, with almost two separate meanings for the term. The first meaning is that the bestiarii were men who fought animals in combat in the Colosseum, and not really gladiators, as that term typically refers to someone facing another man or woman opponent. In fact the bestiarii were often criminals or prisoners of war and battles, whose punishment was to fight against a fearsome creature like a lion. It was very common for men given this punishment to look towards suicide as a way to escape their fight, as typically their chances were extremely low and the fear the night before such a fight must have been overwhelming. The other known meaning for the term bestiarii is that these people were actually the animal keepers or managers of the amphitheaters. Their role would have been to look after, feed, source and manage the animals come the time of the event. It’s likely that both these meaning may have used the term bestairii. 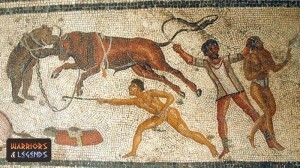 There was another type of gladiator, in fact i use the term loosely, they were hunters and known as venatores. These entertainers were sometimes confused with bestiarii, but the differences are huge. The venatores were not criminals but hunters, and thrived on the thrill of competing against animals to prove their skills, but we will cover the venatores in more detail in a separate article. So the bestiarii had many perils to face, but before we move onto them, lets look at the weapons and armour that there men would be provided with before being thrown to the lions, so to speak. It’s actually very difficult to know with any certainty exactly what fighting equipment the dammed bestiarii were given. There are various murals that depict then with spears and this was likely a common weapon, cheap to make and disposable for the criminals and war prisoners, who were not really expected to win. Many depictions show men fighting animals wearing more traditional gladiator armour but its likely that there were the venatores rather than the bestiarii, who we can presume were rather modestly armoured and armoured. 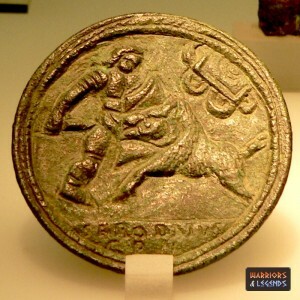 A stone coin depicting a bestiarii. There are many legendary tales of bestiarii events and combat, including on where a lion is said to have dispatched over 200 bestiarii in one event. I think we can likely assume that the fighting style of the bestiarii was focused on keeping the animal at range using their spear, ideally looking to puncture a vital point, an artery or maybe an eye or throat on the animal bearing down on them. To be in the unfortunate position of having to face an animal or animal in the Colosseum must have been a truly fear inspiring situation. The bestiarii as criminals or war prisoners had no choice in the matter, and their fate now in life was to provide entertainment for the citizens of Rome, typically losing their life in battle to a fearsome animal like a lion or boar. It’s truly unknown whether bestiarii ever survived or could gain their freedom again, but there may have been cases where a bestiarii was injured but not killed and to know the fate of this person would be truly interesting. As is stands the bestiarii are one of the mysteries of the games of Rome and the blood shed in the Colosseum. 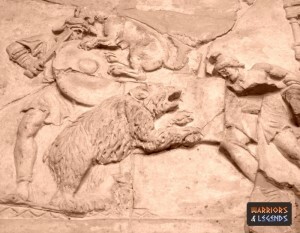 A stone relief of bestiarii in the ampitheatre.